James Burr: The Annotated "Ugly Stories"
Just a "treading water" post, really. 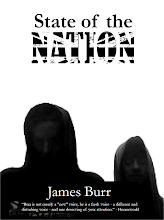 As the Summer gets nearer and the prospect of no longer doing 14 hour days but instead having 3 months to do nothing but write gets closer, I've been thinking more about the "State of The Nation" stories. Most, if not all, of them are satirical pieces and, as with most speculative fiction, they involve taking something in the present (usually something that annoys me) and then exaggerating them to the point where you can get a story out of them to highlight the stupidity and mendacity of what is going on. Indeed, many of the stories (concerning as they do, the loss of civil liberties, the Nanny State, Political Correctness, celebrity culture etc) don't even need exaggerating! As a result I was going to put in footnotes and references to every example used in the stories just to show that the examples were real - yes, they are happening now, and here is the report that proves it! However, I soon realised this would probably jar and ultimately interfere with the flow of the stories. They could also probably irritate some people who would rather pretend that they were "way out there" satire rather than events that are happening now. So, when I finally get the stories together (which may be a while - I seem to work at a glacial pace...) I'll be uploading the relevant references and annotations here, so if people want to see them they can. However, that made me think about the "Ugly Stories" and about how much I loved one thing about the mid 90s UK reprints of PKD's collected stories. At the back of each of the five volumes were a few pages of notes by the Great Man himself - excerpts from interviews where he talked about the story and how it got published, or notes culled from earlier collections where he wrote about what inspired him to write the story, how it was received, what was going on at the time he wrote them. I loved these notes (an early version of the Director's DVD Commentary, I suppose) as they let me know more about PKD in those days before Lawrence Sutin's definitive biography came out. From these notes I found out about how one morning he woke up to find twentysomething rejected manuscripts on his front porch. I learned about those apocryphal tales of Berkely living in the 60s, of the dark-haired girls he invariably fell in love with again and again and again, of how he was so poor at one point he and his wife were reduced to eating dog food.